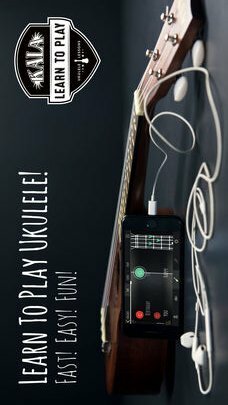 Kala Ukulele App is the fastest way to tune your ukulele and learn new songs. Includes easy-to-play-along chords, lyrics and backing tracks, Color Chord system, and real feedback! Itâ€™s easy: The app breaks down songs into four simple ukulele chords that you will be able to master in an instant. No knowledge of tabs or sheet music required. Have fun with easy-to-play versions of over 100 traditional songs for free, or subscribe to get full access to over 2000 hit songs offered by Musopia. The perfect learning tool for beginners and an awesome songbook for more advanced players, our app also works perfectly with the Color Chords system. Simply follow our easy-to-use play along system to learn how to play ukulele songs today! Kala Ukulele app displays the songs in a play-along style with easy chords, lyrics, and adjustable backing tracks. The app uses your deviceâ€™s microphone to track your playing and offers you high-level feedback on how to improve your skills and speed up your progress. You can also enhance your learning experience with chords and strumming video tutorials, which can be accessed whenever you need. Only 10 minutes of daily practice will have you playing your first song today and rocking with your friends in no time! Forget the frustration with complicated notes and tabs. Four simple chords that will have you playing new songs in no time. Signature Color Chords song category that matches the Learn to Play Color Chord System. Get useful tips on how to improve your skills: Kala Ukulele tracks your performance and gives you feedback. Extra tools that will help you learn: tutorial videos, adjustable tempo, transposing to easier chords, chord charts, and a strum machine. Super accurate and easy-to-use tuner. Select your favorite songs from the music library to create your own songbook. Carry the best songs and lyrics in your pocket so you can throw a ukulele play-along party wherever you go! After downloading Kala Ukulele app, you will receive a free 4-day trial of Musopiaâ€™s premium subscription which offers a full access to the interactive songbook with over 2000 hit songs. The use of Kala Song Selection, Color Chords Song Selection and the Tuner will always be free. We want to know how we can improve your learning experience and will be thrilled to hear what you think about Kala Ukulele! Kala Ukuleleâ€™s partner Musopia offers several FULL ACCESS subscription packages that unlock unlimited access to Musopiaâ€™s Premium Catalog and their new weekly releases. Subscription purchases are charged to your iTunes account upon confirmation of the purchase. All subscriptions will be AUTOMATICALLY RENEWED unless auto-renew is turned off at least 24 hours prior to the end of the current subscription period. Your iTunes account will be charged the renewal price, which equals the price of the original subscription, within 24 hours prior to the end of the current period.